When the military was nothing but boy-bands. A high-pitched drone of violins imperceptibly morphs into the far-off air-scream of a diving German fighter plane. From the expanse of grey sky, a jot of shrill steel, growing into an engine roar, swelling into machine gun slaughter over a beach where 400,000 Allied soldiers huddle, stranded by circumstance, packed like lemmings, waiting for deliverance on the beach at DUNKIRK. Writer-director Christopher Nolan’s DUNKIRK follows the civilian-aided evacuation of 400,000 British, French and Belgian troops from the beach at Dunkirk on the north coast of France, during WWII. But it’s not a war movie. It’s a thriller, almost a horror movie, as an isolated location is established, an unseen enemy attacks, and our protagonists are murdered in the most gruesome manner possible. Opening title cards sketch the situation, otherwise there is no politics, no history, no character development, no Hitler (and his inexplicable orders to quell the air attack and tank advance which would have decimated the Allies irrecoverably), not even any Germans! There is but ONE GOAL – to get home! And surely, the white cliffs of Dover were just over the curvature of the Earth (OR – for the Flat-Earthers – just out of sight due to distance). Usual reaction of men to a One Direction concert. Stretching like an isthmus from the beach at Dunkirk, “The Mole” was a long dock for deep-bottomed ships to get close enough to pick up passengers. Even so, the British ships were too deep. Scenes of men crushed like sardines on this open dock, trying to take cover where there is none, as enemy planes strafe them arbitrarily. Meanwhile, Commander Bolton is overseeing the boarding of ships. An air attack on the medical vessel. It starts sinking. Bolton screams, “Push her off! Don’t let her sink in the bay!” The heartless command, to abandon all hope for that ship, while making way for other ships to pick up the living! Like many others, Mr. Dawson would cast off for the rescue before British soldiers could get onboard and formally requisition his vessel. It was 28 miles he could handle himself. Three Supermarine Spitfires, the sexiest of warplanes (Dawson notes as they skim the skies above his boat: “Rolls Royce engines – sweetest plane ever built!”), take to the skies from Britain, in a journey that was so quick they would have enough fuel to arrive at Dunkirk, dogfight, and then fly back to Britain. It takes us awhile to realize just how brilliant Christopher Nolan is: Cutting between three segments of action that are not taking place at the same time, but converging with each other in DUNKIRK’s final act! Only then will it become apparent what “One Week,” “One Day,” and “One Hour” truly mean. The Mole’s events are taking place over the course of a week before the final act; likewise, Mr. Dawson has set course for Dunkirk one day before the final act, and Farrier has taken to the skies merely one hour before the final act. And even then, we see events from many different perspectives: Farrier’s Lieutenant goes down, and we see it from Farrier’s point of view; later we would see it from the Lieutenant’s point of view, stuck in his sinking plane, as a civilian boat hoves to his rescue; and later still, we would see events from the boat’s point of view – as Mr. Dawson, dealing with the madman onboard and a dying boy, rushes to help the sinking pilot! Likewise, Mr. Dawson sees the approaching German bomber early in the movie, and only in the final act, Farrier, having checked his fuel and pushing that throttle forward, dives his Spitfire out of the sun to handle it… Like MEMENTO, like INCEPTION, Nolan is once again playing three-dimensional chess, while we’re trying to keep up with our Hungry Hungry Hippos. 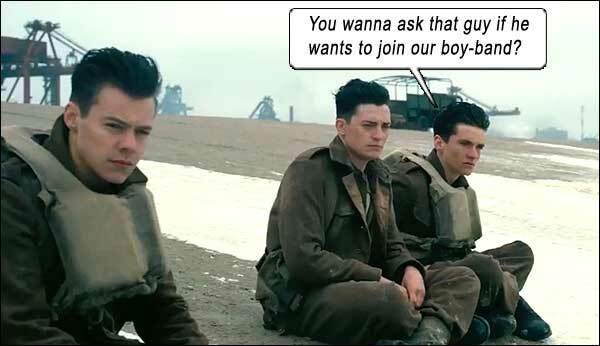 Speaking of youthful silliness, appearing as a young soldier on the beach at Dunkirk – Harry Styles from the boy band One Direction. If not noticed, he might easily be regarded as just another great middle-foreground actor pulling a somber, subdued performance at The Mole. He’s not whining nasally [I think you mean ‘singing,’ Poffy – Ed. Note] nor gadding about in that heterosexually-challenged manner known as “marketing to preteen girls,” so fades into the fabric of this striking film, as he should, as an ensemble player. 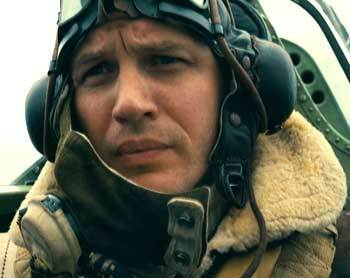 We shall fight on the beaches. We shall fight on the landing grounds. We shall fight in the fields and in the streets. We shall fight in the hills; we shall never surrender. And British Prime Minister Winston Churchill had to rally Britain after this seeming ignominious capitulation. It almost feels as if Nolan inserts Churchill’s “fight them on the beaches” speech as dramatic license (as narration under a final montage of soldiers returning home) but Operation Dynamo is, in fact, the actual event that spurred that slurry speech on June 4, 1940. In that jowly manner that has gotten more pronounced as imitators do him no justice. 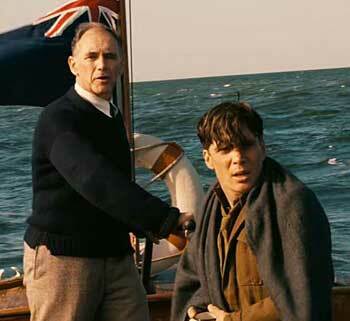 As the Dunkirk troops return in myriad transports into the British towns, they believe they will be scorned as fleeing cowards, but the combination of the military-civilian rescue, Churchill’s speech and the Movie Orchestra Swell ensures they are touted as returning heroes. A country united by jowls. Of the 400,000 troops stranded at Dunkirk, the British High Command hoped to evacuate 45,000. They got 360,000. The ragged fleet of civilian boats did not all arrive at once – as they do in the movie – although it does make for another tearful moment when Bolton sees them through his binoculars. Bolton: “Home.” And dramatic license. Starring: Fionn Whitehead, Damien Bonnard, Aneurin Barnard, Barry Keoghan, Mark Rylance, Tom Glynn-Carney, Tom Hardy, Jack Lowden, Will Attenborough, Kenneth Branagh, James D’Arcy, Matthew Marsh, Cillian Murphy, Harry Styles.